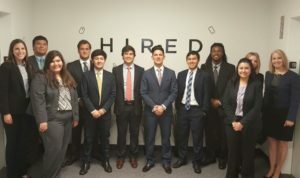 Students from the Greehey Scholars Program recently traveled to San Francisco to visit the headquarters of top companies — giving the St. Mary’s University students up-close interactions with leaders in the tech industry. The trip included site visits to Google, PayPal and Hired, Inc. headquarters, which offered a variety of different opportunities for students to learn about product innovation, career tips on how to market yourself, and global sales. “The Greehey Scholars helped choose the companies that we visited, researched the innovative products or services offered by each of these companies and thought about interesting questions, in advance, that piqued their curiosity,” said Suzanne Oliva, J.D., who is Visiting Professor of Accounting and Director of the Greehey Scholars Program. During the trip, 11 Greehey Scholar students attended lectures, toured facilities, and interacted with management and employees, including St. Mary’s alumni Ben Barling (B.B.A. ’06), who works in sales products at Google, and Amanda Crosby-Rickman (B.B.A. ’12), senior talent advocate at Hired, Inc. First-year Greehey Scholar Hannah Odom shared how she has grown as a person, an academic scholar, and as a business professional through experiences such as this one.